Cyclo Vac is one of the most trusted brands in North America and has been in business since 1960. Cyclo Vac is manufactured and assembled in the province of Quebec, Canada. This company is family owned and operated and has distribution offices in Europe, USA, and Canada. Need a Central Vac in your home? No problem! Our certified installation technicians install in any home, new or existing home, standard or retrofit install. We service and install central vacuum up to a 100-mile radius of either location our Burnsville or Faribault location. Faribault, Northfield, Owatonna, Medford, Kenyon, Waterville, Elysian, Morristown, Wanamingo, Zumbrota, Elko New Market, Montgomery Lonsdale, New Prague, Rochester, Mankato, and greater Rice, Steele, and Goodhue Counties, and most of Southern Minnesota and Western Wisconsin. Because of its powerful motor and large air flow, central vacuums pick up deep down dirt, dust and debris, even microscopic particles like pollen, mold spores and dust mites. Central vacuums eliminate all those dust particles you see in the air after vacuuming with a portable as well as that familiar “vacuum smell.” Unlike a traditional vacuum cleaner, which recirculates into the air some of the dirt and particles it picks up, a central vacuum removes 100% of all vacuumed dirt, particles and allergens from the home. Because 100% of the vacuumed material is removed from the home, indoor air quality is significantly improved. In fact, the University of California Davis School of Medicine found that allergy sufferers’ symptoms can be improved up to 61% when using a central vacuum system. No heavy equipment to lug around, no cords to trip over or catch on furniture, no clunky unit nicking the furniture and woodwork as you move from room to room. Lightweight hoses and attachments are easy to carry. Convenient outlets placed to your specifications allow quick and efficient cleaning. Quick-clean accessories provide instant access to vacuum power for life’s daily messes! A complete central vac system can be professionally installed in the average home for less than the cost of many high-end, name-brand portable vacuum cleaners. Because it will provide powerful cleaning for a decade or more, a central vacuum system is more of a wise consumer bargain than a luxury. Having trouble with your central vac? Our experts can give you free troubleshooting advice to fix your central vacuum. We can help you do it yourself, or make a house service call. We also can un-clog a clogged central vacuum system. Click here to see brands we repair. The Cyclo Vac brand is a more refined central vacuum when compared to other central vacuums on the market. Most clients notice how quiet the systems sound & operate, all models come with a High Efficiency filtration system and the deluxe models feature Datasync technology, which allows you to control the speed of the motor and gives you diagnostics on your hose handle and power unit. This benefit helps you estimate when its time to change your filter bag, carbon filter or warranty options. Power units range in size from compact, small, medium and large power units. The compact units are for condos/townhomes all the way up to 20,000 sq. ft. homes. 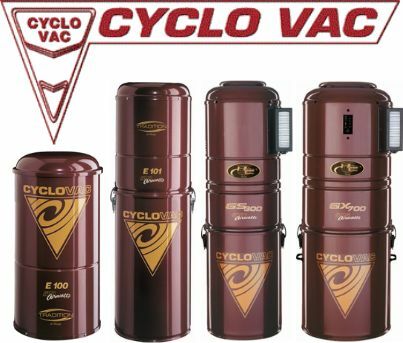 For more information about Cyclo Vac click here.